100% deposit bonus up to $600. Home of the FTOPS tournament series. Second largest site in the world. 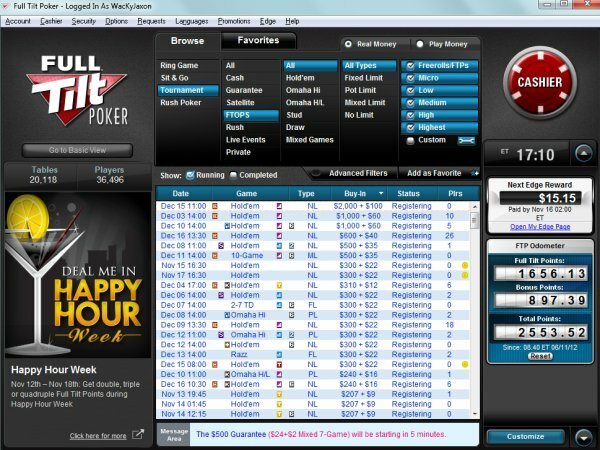 Full Tilt is one of the largest real money online poker rooms available today. It has a huge variety of cash games, sit and gos, and multi-table tournaments and also runs a tournament series called the FTOPS once every three months that attracts the best players in the world. 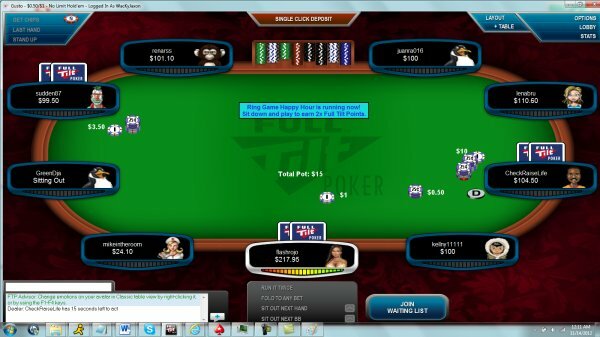 Full Tilt Poker’s software is very easy to navigate and provides a great user experience. Like its sister site, PokerStars, Full Tilt, formerly Full Tilt Poker, offers new customers an initial signup bonus of 100% up to $600 and a number of reload bonuses throughout the year. The bonuses are fairly easy to clear and, at the same time, you are eligible for other rewards in the FTP Store and Edge rewards program. The latter allows you to earn up to 25% cash back on your rake, paid out on a weekly basis. You can also earn FTPs, which you can use to purchase tournament tickets, cash game tickets, bonuses, and merchandise. Many people feel that Full Tilt has the easiest to use software in the industry. The lobby is simplistically organized between ring games, Rush Poker, sit and gos, and tournaments. Within each setting, you'll find simple filters and advanced filters to assist you in quickly finding what you are looking to play. Rush Poker is a fast-paced cash game with buy-ins ranging from $0.02/$0.05 to $2/$4. When you fold your hand, you are immediately brought to a new table. Whether you have a few minutes or a few hours, it is a fun game to play and you can sit out at any point. Full Tilt offers a huge variety of sit and gos. Besides the standard one-table and multi-table sit and gos, the online poker room offers a variety of games that are not found anywhere else including Rush On Demand, Matrix, and Step Sit and Gos. Rush On Demand runs from $4.40 to $26 limits. In those, once a minimum number of entrants register, a fast-paced Rush sit and go begins. Players can late register up until the end of Level 5. Matrix sit and gos are one-table tournaments where you are playing the same opponents at four different tables simultaneously. Your performance on all of the tables dictates how much cash you win at the end. Step sit and gos start at $1 and you can move up and down the ladder until you reach a $2,100 Step sit and go. If you win the final step, you can win close to $8,000. Full Tilt offers a huge diversity in tournament types. The tournament speeds include regular, turbo, and super turbo. Although the most popular format is Hold’em, tournaments can be found in many different poker varieties including Omaha, Stud, and Mixed Games. Full Tilt's tournament varieties include double stack, deep stack, double chance, triple chance, multi-entry, knockout, shootouts, satellites, cashout, and Rush. It isn’t uncommon for Full Tilt to combine these formats in a single tournament. Besides daily and weekly tournaments, Full Tilt also has a special series once every three months called the FTOPS. These tournaments range in buy-in from $109 to $2,100 and attract the best players in the world. Full Tilt also runs many satellite tournaments and sit and gos to make entry more affordable for the casual player. One month after the FTOPS, Full Tilt typically runs a Mini-FTOPS, which is identical the FTOPS previously held, except the buy-ins are one-tenth as large. Full Tilt’s software also has the ability to customize numerous widgets. These include showing your cash back rewards, number of people registered in a sit and go, number of people sitting at a cash game table, your cash balance, and basic session stats. The software also allows you to customize tables and set up buttons for pre-flop and post-flop betting amounts. The hand history replayer runs smoothly and it is easy to access your hand in text format if you wish to review it later or share it with your friends. Another cool feature about Full Tilt is the ability to transfer funds directly from your Full Tilt cashier directly to PokerStars or vice-versa. This eliminates the need to be worried about whether your bankroll is sufficient on the two largest online poker sites in the worlrd. Full Tilt is available on PCs and Macs and most serious players should include it as one to play on.